On December 12th 2014, NZFFA representative on the SFF project team Dean Satchell brought back from Tasmania an exciting present: a live shipment of the “new to NZ” organism, Eadya paropsidis into Scions high security containment facility in Rotorua. Dean had been working with Geoff Allen and Vin Patel from the University of Tasmania, and went out hunting within three Eucalyptus nitens plantations in Tasmania. 75 live female parasitic wasps were successfully caught in butterfly nets and imported into Scions purpose-built and impressively secure Insect Containment Facility. All of them survived the flight. Eadya paropsidis female stalks its prey and delivers an egg into the tortoise beetles body. 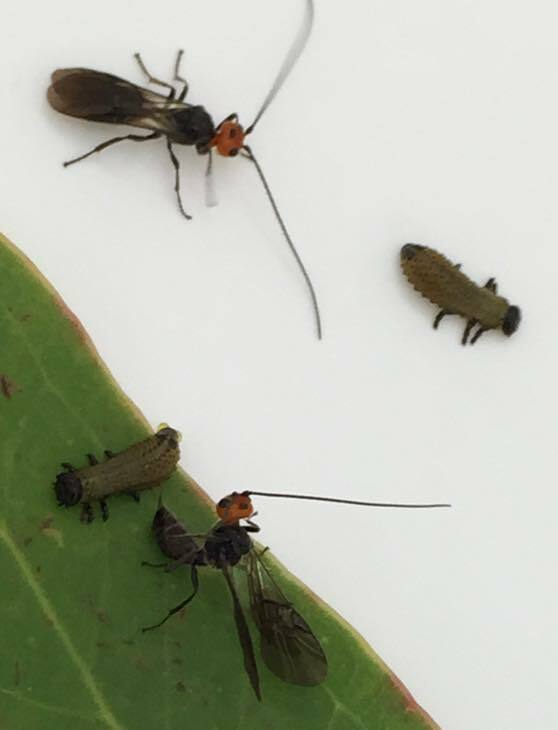 Eadya paropsidis is the black braconid wasp with a bright orange head that the SFF project team have been investigating for the last two years. This parasitoid holds great promise as a new biological control agent of the Eucalyptus tortoise beetle in New Zealand. 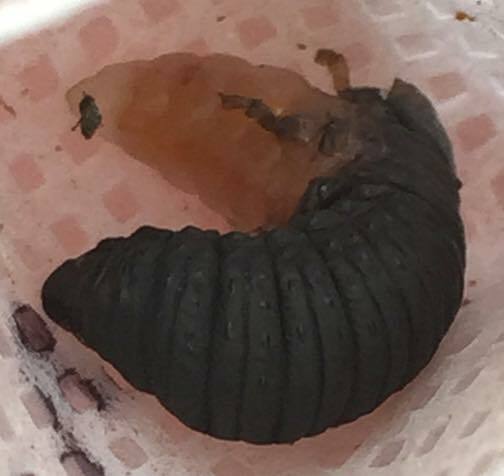 The exciting thing about this particular parasitoid is that it specifically targets the damaging larval life stage during springtime, and in Tasmania it kills around 30% of these larvae, which would otherwise end up as the summer generation of adults. the host remains. Photo: S. Kirk, Scion. Research during the SFF scoping study has revealed Eadya paropsidis specifically hunts on eucalyptus foliage in young plantations for tortoise beetle larvae within the genus’ Paropsis and Paropsisterna, stinging young larvae (any larval life stage can be attacked, but the wasp is most successful attacking second instar larvae) and laying an egg inside them (see photo). Only one parasitoid develops to maturity within each host larva, which takes about 21 days. After consuming about 55% of the beetle larva, they then burst out, killing the host, and pupate within the soil. After hibernating as a pupa for the rest of the year the resultant adult hatches again the following spring. The biggest challenge now facing the entomology team working at Scion will be inducing the next generation of parasitoids to emerge from hibernation (diapause) next spring. They will attempt to trick the Eadya paropsidis into thinking the high security laboratory they are safely locked within, is actually the outdoors, by taking them through an artificial winter. If they can succeed, then next summer assessing Eadya paropsidis host specificity against a range of NZ native and beneficial beetles can begin. Safety testing is the key component of any biological control project, and only the safest of new organisms will ever be considered by the EPA (Environmental Protection Authority) for release in NZ.